1 bar creamed coconut (Biona brand or Thai Gold from Ardkeen Stores or Full of Beans) or swap for 2 x 400mls tins of coconut milk and reduce the veg stock by half. ½ tsp cayenne or chilli flakes – for some heat if you like it hot! 500g chicken breasts, finely sliced. 1. Place the garlic, onion, ginger in a large saucepan with 1 tbsp of oil. Fry over a medium heat for 3 minutes and then add all of the spices and chilli if using. Fry gently for 2-3 minutes to gently toast the spices. 2. 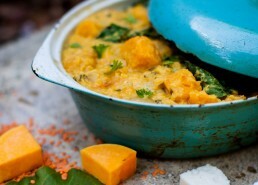 Now, add the squash, lentils and the creamed coconut and cover with the vegetable stock. At this point divide your amount into vegetarian and meaty curry ie how many want chicken / veggie curry so you will be working 2 pots from here on in. Add chicken strips to the meaty pot. Now let them both simmer on medium for 15-20 minutes until the lentils and squash are soft. You might wish to add the extra 200ml (1 cup) of water during cooking – it depends if you like your curry thicker or thinner. Lentils “drink” a lot of liquid during cooking so watch it as it simmers and stir occasionally. 5. In the last 2 minutes, add the spinach and stir through. 6. Turn off the heat, add the sea salt and pepper, the juice of the lime or lemon and check for seasoning and consistency. If it’s too thick with not enough sauce, thin it out with some extra water or veggie stock. 7. Stir through the roughly chopped coriander and serve with some basmati or cauliflower rice. Enjoy! The vegetarian version of this suits me sometimes, not always, but is nice for a change, so I make a big batch and have vegetarian version one day and the chicken version the next day, sorted. Back to that batch cooking again. PS - we are still delighted, in fact we encourage you to bring in your resuseable containers. We will gladly pack your purchases in your reuseable containers!!! This delicious classic dish can be a real family favourite so I hope you enjoy it. Packed with immune boosting onions and garlic, iron rich beef and kidney beans to help keep your fibre intake optimal, this dinner ticks lots of boxes on the health front. This recipe serves approx. 4 adult size portions but I say double it, and get 4 extra portions in the freezer to get you through the predicted cold spell in the coming weeks! You can make this either on your hob or slow-cooker. Serve with some avocado slices and steamed rice. • 2 tbsp mild chilli powder – reduce to 1tbsp if the kiddies don’t like the heat! 1. Heat your oven to 150C/fan 130C/gas 3. Heat the oil, preferably in a large lidded casserole dish, and fry the onions until soft. Add the garlic, spices and oregano and cook for 1 min, then gradually add the mince, stirring well until browned. Stir in the tomatoes, water and then crumble in the stock cubes and mix. 2. Cover and simmer gently for 30 mins, stirring occasionally. Stir in the peppers and sundried tomatoes, then cook for a further 30 mins. Then stir in the beans and simmer gently for 3-5 minutes, until the beans have warmed through. 3. If you want to use a slow cooker, fry your onions in a pan for 8 mins, then add your garlic, spices and oregano and cook for a minute. Tip all of the ingredients into your slow cooker, crumble in the stock cubes and mix well to break up the minced beef. Cook on Low for 8 hours, then serve. So Christmas has come and gone, and it's the start of a brand new year. Usually, the new year brings lots of talk of a "New You", “January detox”, “New Year Cleanse” and all of that waffle! When you understand the inner workings of the human body, you quickly realise that there really is no such thing as “cleansing foods", which magically make your liver and kidneys work at full throttle to undo all of the overindulgences of Christmas. Detoxification is a process that is happening on a continual basis, and not just during a “quick-fix” 3-day juice fast. There are, however, some foods which support specific pathways that your body uses to rid itself of the by-products of alcohol, for example. So do your body a favour this January, up your intake of plant fibre, antioxidant-rich spices and coloured veggies every day. 30 minutes of walking and 1-2 litres of filtered water also help to get the pathways of elimination working well. Therefore, you will be encouraging good detoxification 365 days of the year not just after Christmas. So pop this nourishing casserole on your new meal plan for January. No starvation and no juicer required! Only whole, real food. 4 pieces of chicken – you can use breast if you wish, my preference is thighs or leg. Coat the chicken in the garlic, coriander and paprika. If time permits, cover the spiced chicken pieces and pop them in the fridge to marinate for between 1-3 hours. If not, you can cook them straight away, and it will still taste amazing. In a large casserole dish, sweat down the onion for approx. 8-10 minutes until soft. Then, add in the apricots, lentils, the tin of tomatoes, stock and chicken. Stir well, cover and cook in the oven for 1 ½ hours. Serve with some stir-fried or steamed green veggies and a sprinkle of coriander. This tastes even nicer the next day so double to quantity and make a big batch to pop some portions in the freezer. I’m with you all the way on that one Jemma. No self-flagellation here. The thing that Jemma has told me and has made the biggest impact on how I eat is forget the guilt. If you are not eating well, you know you don’t feel well etc. but we all have to eat the cake, eat the chocolate and drink the gin. Life is so short. So if you’ve enjoyed your food at Christmas, make sure to continue to enjoy it but perhaps more of the energy boosting and cleansing type. This looks delicious and I think I’m going to fling it into the slow cooker on low for 6-8 hours. I’ll let you know how I get on. Onwards and upwards to you all for 2019. My resolution is to be healthy and happy as I can be but there’s still some Christmas cake here and you couldn’t throw it out!! Happy New Year to all of our loyal customers. Wishing you all the very best of health and happiness for 2019! Perfect for our cold weather and light on the tummy too. Something warm and comforting reading when you come in from the day!! 1. Place whole chicken breasts on the bottom and top with carrots, onion, celery, garlic, olive oil, thyme and bay leaf. 2. Next add in chicken broth, water, and season with salt and pepper to taste. Cover and cook on low heat 6 – 7 hours. 3. 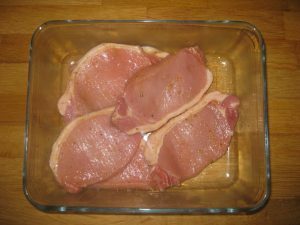 Remove cooked chicken breasts and cut into bite sized pieces. Place chicken back in to the slow cooker. 4. Cook your noodles separately according to the instructions on the pack and add to slow cooker along with the parsley and stir. Serve and enjoy! 1. Put all your ingredients into the slow cooker and cook on high for at least 12 but preferably 24 hours. The longer you simmer it, the more flavour some it will be, but keep in mind that it will reduce and you will end up with less. When it has finished cooking, allow to cool a little and then sample your broth. Add sea salt to taste. Strain the broth, push some of the veggies through the sieve. Your stock is now ready for use or you can package it up or use it to make your slow cooker chicken soup as above. 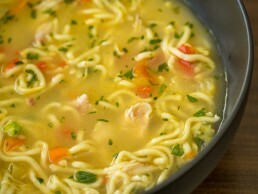 This divinely easy slow cooker chicken soup is such a nutritious boost for the immune system. If you choose to make it with the homemade broth, you’ll be getting a wonderful mineral and gelatin rich broth that is not only a useful cold fighter, but also supports good digestive health. I often add in some greens like a good handful of cabbage, spinach or kale approx. 10 minutes from the end of cooking time to increase the vitamin and fibre content of the soup. Enjoy! Tips from the butchers’ wife. Delighted that a soup was included in our slow cooker special. At the weekend I often cook up a batch of vegetable soup so we’ve something hot when we come in from activities. Without the added protein vegetable soup just wouldn’t sustain and keep you satisfied for long. This one, with the added addition of chicken, is a meal in itself and will be a great addition to our lunch boxes. I bought really handy food flasks in home store and more and we all use them for work and school. Remember the ratio of dried herbs to fresh. 1:3. Dried herbs are more intense than fresh so less of the dried!! Batch cook and use for a couple of days too!! Preheat your slow cooker. In a large pan add 1 tbsp. of the butter and brown the lamb shanks all over for approx. 10 minutes, then transfer them to the slow cooker. Add the remaining butter to the frying pan and fry the onion gently until it starts to soften, then stir in the tomato purée and flour and cook for one minute. Add the red wine and bring it to a boil, stirring the flour and purée into the wine until you have a smooth sauce around the onion pieces and add to the slow cooker. Pour the stock into the same pan and bring it to a boil, then tip into the slow cooker. Add the carrots garlic, bay leaves and herbs to the slow cooker and put the lid on. Cook on low for eight hours or on high for four hours. Turn the shanks over at some point during the cooking. After eight hours the lamb should be tender and starting to fall off the bone. Slow cooked meats are just the best, in every sense! Nutritionally and on the taste buds too. 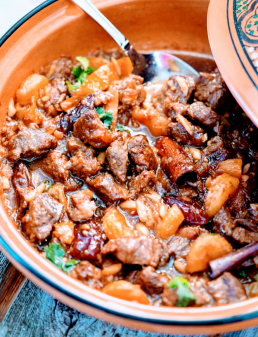 Slow cooking meats in this way preserves more of the delicate healthy fats such as omega 3 fatty acids which are beneficial for immune and cardiovascular health. Lamb is a wonderfully rich source of these amazing fatty acids as well as minerals such as zinc and selenium. This dish is also packs a useful iron and B vitamins punch which help to lift flailing energy levels. Including some of the therapeutic herbs such as rosemary or thyme also increases the antioxidant compounds beneficial to immune health. Feel free to add in some extra veggies such as celery or red pepper 1-2 hours before the end of the cooking time to make sure you get your 7-a-day in! Tips from the butcher’s wife. A recent convert to the slow cooker thing – Shane is loving the advantage of a hot meal ready when he finishes training. This is what he had to say about this week’s dish. 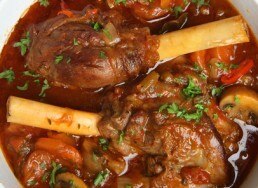 Lamb shank is one of my new favourite dishes as I only tried it recently and I love it. I popped it in the slow cooker on top of vegetables along with pepper, ginger and garlic. Boo – if you saw me now you’d be scared – I’m up since before the crack of dawn trying to get some work done before the children descend on me. They’ll all be flying high today. The butcher as usually is gone since the early hours but not without leaving a trail of destruction in his wake…. Yesterday in a last minute bid to embrace all that is Halloween I bought a few decorations with the kids. One is a fake mirror that is sensor operated and has a very scary skeleton reveal himself and say scary stuff as you pass. We hung it inside the front door and we were waiting with great excitement to see himself come home and jump out of his skin with fright. Of course, it was cheap, and the sensor didn’t work. You had to press a button to get it working. So we pressed it when we passed and all we’re suitably scared. The butcher and I were the only two awake as he left this morning – and guess what. As he walked passed it, the sensor worked for the first time ever. It’s very loud. The front door closed and a few seconds later a tear stained Harriet peered around the door of the office. God love her. ‘I hate it Mammy, I hate it’. Ah Lord…it’s going to be a long day. We’ve only two dressing up this year – two out of four. This makes me sad. Little indicators that they are growing up. Last year for book day, the three that are left in primary dressed up. They were all very excited. Our eldest boy who was in fifth class then dressed up as Asterisks. He’s a large, round and funny Viking type character and we had great crack putting the outfit together. So everyone was up early and got dressed up. 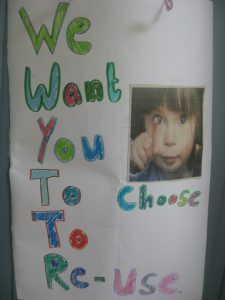 We arrived at school and as soon as our son realised that little or no one was dressed up in his class he freaked out. He was very upset. I brought him home to change. He felt like a fool. I was gutted. I had been delighted with his excitement and I suppose maybe hanging on to the innocence a bit longer clouded my judgement and didn’t warn him that maybe his peers weren’t dressing up. But his excitement led me to believe they all were. I dropped him back to school in his uniform and drove away, tears rolling down my face. A little bit of innocence gone for him and a little bit of his confidence taken away. So if the kids are dressing up. If there are clothes and fake cobwebs everywhere and you’re tripping over skeleton bones and the decorations. If there’s face paint smeared into the couch (aghhhhhhhh…) it’ll pass. And then they won’t want to dress up. 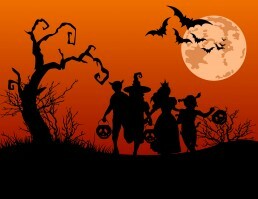 My eldest isn’t dressing up this year. Won’t risk it. I’ll stop now because I’ll blubber. Jemma has given me this fab recipe. Although the butchers wife tips says I haven’t tried it because I hadn’t at that point but since. I’ve actually made it twice or should I say the butcher stuck it on twice. That’s a big flashing light saying how say this is… His go to meal is Daddys’ famous toasted sandwiches. Try this, divine. We has it potatoes and carrots and with stir fried vegetables and rice Monday night. Combine all of the spices together in a bowl and mix. Rub the chicken with 1 tbsp of soft butter to coat the surface of the chicken. This helps the spices to stick to the chicken but also creates a lovely brown skin by the end of the cooking time. Sprinkle the spices over the chicken and rub them so as all of the surface of the chicken is covered in the mix. (You let this marinade overnight if you have time for extra flavour) Lay the onion slices on the bottom of the slow cooker, add 100mls of water and then place your chicken on top. Cover with a lid and cook on low for 7-8 hours or on high for 4-5 hours. Then allow it to rest for 10 minutes before carving. Enjoy! So this is what will be cooking in my kitchen next Wednesday for a Halloween dinner. I’m already filled with dread at the thoughts of all of the sticky, sugary sweeties that my kiddo’s will collect after some “Trick or Treating”. So the secret is to get a hearty, protein rich dinner into them an hour or 2 before trick or treat time to prevent mega-sugar highs and lows (that and disposing of 9/10’s of their sweetie haul when they go to bed that night, but shhh! Don’t tell them that!). This fits the bill. I can pop this in the slow cooker around 9am and look forward to a scrumptious roast chicken dinner by 4pm. I often pop in some whole, peeled carrots and parsnip about 1-2 hours before the end of cooking time and that’s the veggies taken care of. Or you can serve with roast veggies and steamed baby potatoes. I’m really excited about the upcoming slow cooker recipes. Have I mentioned I LOVE MY SLOW COOKER – how has it come to this – I used to have a life. Honestly I did. But now I am busy…. Busy busy busy and anything that reduces the stress and feeds me well I love. My needs are simple. I would definitely marinate this the night before – take it out of the fridge in the morning and stick it on – haven’t tried this yet but Halloween is coming and I’ve a list of recipes to try. I must admit I’ve been rolling out the old reliables. 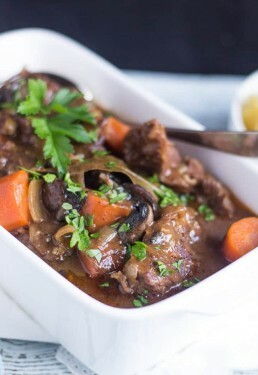 So want a stock of new easy slow cooker recipes. I’ll let you know how I get on. Just a question for Jemma – by dispose of the junk do you mean eat them yourself. That’s how I interpret that – it’s for the good of the children after all!! 1. Put the beef in a large mixing bowl, and pat it dry with paper towels. Season generously with salt and pepper. 2. Preheat a large cast-iron or heavy pan over a high heat. Drizzle with olive oil and sear meat on all sides until golden brown with a crust, 8 to 10 minutes. Transfer meat to the slow cooker. Reduce heat to medium and add garlic, onions, carrots and thyme and season with salt and pepper. Scrape the pan with a wooden spoon to loosen all browned meat bits and cook 3 to 4 minutes. If needed, add a splash of water to fully deglaze the pan and then transfer to your slow cooker. 3. Add mushrooms, barley, stock and soy sauce; cook on low for 6-8 hours. The meat should be very tender. 4. This would be delicious served with some steamed broccoli and basmati rice or baby potatoes. Slow cooking is not just an easier, tastier way to cook but it also a very wholesome way to cook too. Cooking at lowered heat over longer periods of time reduces potential damage to the delicate healthy omega 3 fatty acids contained in the meat and can also increase the release of antioxidant compounds such as beta carotene from the carrot also. Tips from the butchers wife. I can’t tell you how much I love my slow cooker. I just bought another one because I wanted a bigger one – It was €60 and you can put the pot on the hob so there’s no extra frying pan to wash. I usually cook in the morning (before I shower so I don’t smell like dinner all day). You could also put it on at night if the cooking in the morning proves a step too far but I find in the morning you just fly through it because there’s no time for faffing. No big tip this week except to say, get a slow cooker. Coming home to a warm dinner is just bliss!! Although this dish might take a few minutes longer to cook, it is a perfect pre workout if you are planning on training at a steady state aerobic session, as your body will use the fats as it’s main energy source. Along with that you are also getting huge recovery and health benefits from the large amount of vitamins and minerals. On a cold, wet night this is definitely one of my favourites. So why not give this a go..... the slow cooker is a life saver. Warm nutitious meals after a long day. Heat the olive oil in a large heavy based saucepan and brown the lamb well on all sides. Season generously. When you’ve got a good colour on the meat, after about 5 minutes of stirring and browning on a relative high heat, add the onions, garlic and ginger and cook out for another 2 minutes, until the onions start to soften and carmelise. Add the harissa and spices and mix really well. Cook for another 3 or 4 minutes so that the spices and harissa coat the meat. Add the stock, cover with lid, turn down the heat and simmer for at least 1 hour, stirring occasionally to make sure nothing is burning at the bottom of the pan. At this stage you can let cool and leave in the fridge overnight and cook the following day, which allows the flavours to develop further but you can continue in one go. Add the tomatoes, prunes, olives and pistachios and cook, uncovered for another hour. At this stage it should have reduced to a nice consistency and the flavours should be really good. The bottom line is that the lamb need to cook for 2 hours in total which can be done in one go or split over 2 days. Garnish with the coriander and serve with rice. Yum ! Lamb is such a favourite of mine, both because of the delicious sweet taste but also because I know how nourishing it is. Rich in easy to digest iron, b vitamins and zinc, lamb makes the perfect winter boost if the energy levels are flagging. Lamb is also a relatively wild meat, outdoor reared and feeding naturally year round on the grasses and plants that they've always eaten. Owing to this, lamb is rich in omega 3's and also in conjugated linoleic acid (CLA) which has been linked with lower body mass and seems to help with weight management. The ginger, fennel seeds, and prunes contained in this recipe make it rich in antioxidants, easy to digest and a wonderful source of soluble fibre. So if you would traditionally have found that red meat slows down your digestion, you'll be pleasantly surprised by this dish! This dish freezes really well so be sure to make plenty and store some for those cold, dark nights! Serve it with some roasted root veggies or roasted cauliflower." Well, we are thrilled in store with the reaction to our reusable containers initiative. Lots of you brought in your own containers. This is great - but I feel it’s necessary to not be too holier than thou with this. Let me explain.... I try to reduce the use of plastic here at home - my son was on the green school committee last year and absolutely shamed us into noticing our dependence on single use plastic - a lot when you look at it. So we quit the cling film and they now have a little boxes with their lunch stuff in it. They refuse straws and bring their water in refill bottles. But plastic is still in our home.... we are just trying to be more conscious of our over dependence and the general wastefulness of it all. The environmental impact of it all is also a concern. I'm a proud Laois woman. The only inland county surrounded by inland counties (remember that for the table quiz?) 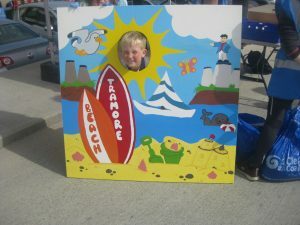 As a child, a trip to the seaside was a real treat. I always loved being by the sea, even though, as an in lander I'm a rubbish swimmer. So I really appreciate the sea on our doorstep and walk the back strand with the dogs as much as possible. It's most definitely my happy place. It's where I go to destress, to escape, to cry, to think. It's where I go to take a big deep breath and recalibrate. When we've been in the house and everyone is killing each other, I pile us all into the car - sometimes very reluctantly, but never ever regrettably, out to the back strand with the dogs. I think it is simply, a really, really special place. So then, when I see rubbish left behind on the beach I am actually in shock. Why? I do think though its mindlessness and if we stopped and thought for one minute we would become more conscious about how our actions impact the world around us. This house is trying - Change is slow but I love that the children are conscious and maybe if we only achieve a better level of consciousness for our children we'll have done something good. 5% off all shopping purchased in reusable containers – WE ARE GIVING YOU BACK THE PRICE OF THE PACKAGING!! Baked Pork Chops with apples Onions and thyme. • 2 small red onions, sliced. 2. Mix together salt, pepper, and garlic powder, and rub on pork chops. Heat olive oil in large skillet at medium-high. Brown pork chops in skillet for 2 minutes on each side. 3. 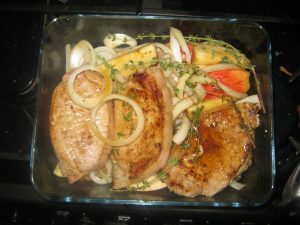 Place pork chops in baking dish along with apples, onions and thyme. 4. Add apple cider and honey to skillet, and bring to a simmer at medium heat. Reduce by half, stirring often and scraping up browned bits to combine with sauce. 5. 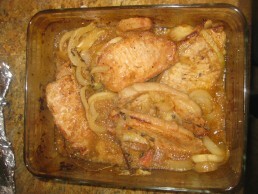 Pour apple cider sauce over pork, apples, and onions. Add thyme sprigs. Cover. Let’s Nutrify! - Jemma Kehoe’s tip. - This recipe is amazingly simple and delicious! Thyme is a wonderful herb to include here in preparation for the cold and flu season that may lie ahead. It has antibacterial action and works very well against coughs as well as certain skin conditions such as acne. The onions and apples are also a source of a super antioxidant called quercetin to support the immune system and gentle, soluble fibre to aid the digestion of the meat. The pork meat is a super source of brain enhancing nutrients including iron and B vitamins so perfect for a mid-week back to school dinner. “This meal is a perfect low intensity/ steady state cardio pre workout fuel, As this food is rich in fats it is sure to keep your energy levels high throughout a workout and also avoid that sugar high and crash leaving you fatigued before your workout is complete. Do not over bake or the meat becomes tough. I did use fresh herbs this time but remember my tip on dried herbs – reduce quantity to a third. This is seriously tasty. Very autumnal. Ideal for the time of year. I served it with mash potatoes and carrots. Enjoy this one, its a goody!! #Tip from Jemma – Let’s Nutrify! Lamb is one of my absolute favourite meats. I adore the taste and the fact that it's a relatively wild meat, but I also love it because of its’ nutrient profile. The iron and zinc content of lamb is excellent, meaning it's a super meat to build the blood and increase energy levels. Which has more omega 3’s – 100gms of cod or 100gms of lamb? You might be surprised to learn that the answer is lamb! You can get almost 300mgs of wonderful omega 3 fatty acids from just 100gms of lamb meat which is a comparable amount to that contained in 1 premium brand fish oil capsule! So if you’re not a fish lover but want to ensure that you get nice amounts of heart-healthy omega 3 fatty acids, enjoy lamb once-twice weekly. “This meal is a perfect quick and easy post workout meal/dinner, containing high percentage of Protein from the meat for recovery, muscle growth and repair. Along with Carbs coming from the Pitta to refuel and top up your Glycogen stores to be able to perform at your best for your next session. Add the spices and mince and cook for 4-5 minutes until the mince loses its raw colour. Tip in the potatoes and 50ml water and cover and simmer for 8-10 minutes until the potatoes are tender. Add the peas and cook, uncovered for a further 2 minutes. Make these healthier, use whole-wheat pittas. Add a side salad of fresh green leaves. Yum! !